The following topics describe and show details of the various properties views for objectives, perspectives, projects, processes, and measures that are available as drill-down options. When you click a drill-down hyperlink, for example, Margins in the Show Measures view, and you select Measure Properties, the drill down takes you to the Measure Properties view, as shown in the following image. It provides details about a selected metric including the formula for computing that metric, aggregation method, threshold direction, and more. When you click a drill-down hyperlink and select Objective Properties, the drill down takes you to the Objective Properties view, as shown in the following image. It provides basic information about the selected metric including perspective, associated theme, and creation date. When you click a perspective drill-down hyperlink, for example, Financial in the Causes & Effects view, and you select Perspective Properties, the drill down takes you to the Perspective Properties view, as shown in the following image. It provides basic information about the selected perspective including the creation date and a description. 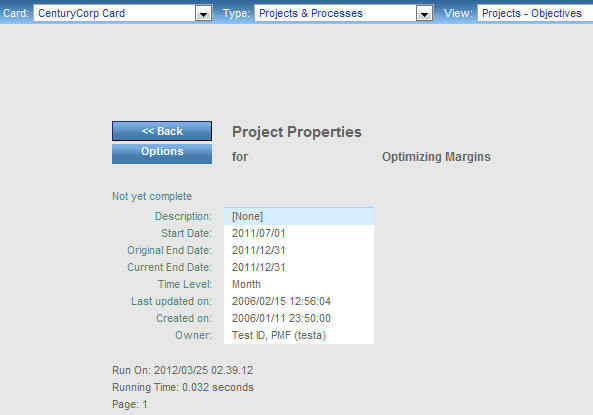 When you click a project drill-down hyperlink, for example, Optimizing Margins in the Scorecard Projects view, and you select Project Properties, the drill down takes you to the Project Properties view, as shown in the following image. It provides basic information about the selected project including a description and the start, end, update, and creation dates. When you click a process drill-down hyperlink, for example, Drop ship for direct vendors in the Scorecard Processes view, and you select Process Properties, the drill down takes you to the Process Properties view, as shown in the following image. It provides basic information about the selected process including a description and the update and creation dates. When you click a drill-down hyperlink and select Related Properties, the drill down takes you to the Related Properties view where additional drill-down hyperlink options are available in the Project and Process columns. The following image shows the drill-down options for the Project column. All five PMF scorecard metrics are displayed in this view: Perspective, Objective, Measure, Project, and Process. To probe deeper into the metric listed in the Objective column, click the Objective hyperlink and select the desired option. For a list of the available drill-down options, see Objective Drill-Down Options. 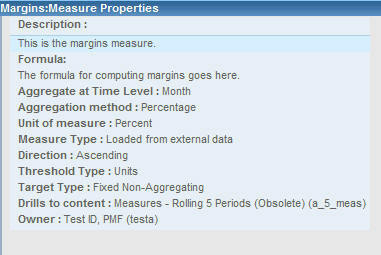 To display additional data related to the measure, click the Measure hyperlink and select the desired option. For a list of the available drill-down options, see Default Measure Drill-Down Options. To display related data for a project, click a Project hyperlink and select the desired option. For a list of available drill-down options, see Project Drill-Down Options. To display related data for a process, click a Process hyperlink and select the desired option. For a list of available drill-down options, see Process Drill-Down Options.